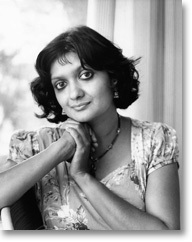 Sujata Bhatt was born in Ahmedabad, India. She grew up in Pune, (India) and in the United States. She received her MFA from the Writers� Workshop at the University of Iowa. To date, she has published seven collections of poetry with Carcanet Press, UK. She received the Commonwealth Poetry Prize (Asia) and the Alice Hunt Bartlett Award for her first collection, Brunizem (1988). Subsequent collections include Monkey Shadows (PBS recommendation, 1991), The Stinking Rose (short-listed for the Forward Poetry Prize, 1995), Point No Point (1997), Augatora (PBS recommendation, 2000), A Colour for Solitude (2002), which deals exclusively with the life and work of the German painter, Paula Modersohn-Becker; and Pure Lizard (short-listed for the Forward Poetry Prize, 2008). She received a Cholmondeley Award in 1991, the Italian Tratti Poetry Prize in 2000, and the German Literature Prize, Das neue Buch, in 2008. She has translated Gujarati poetry into English for the Penguin Anthology of Contemporary Indian Women�s Poetry, and has translated poems by G�nter Grass and G�nter Kunert. Her translations from the German include Mickle Makes Muckle: poems, mini plays & short prose by Michael Augustin, (Dedalus Press, Dublin, 2007). She has been a Lansdowne Visiting Writer at the University of Victoria, in British Columbia, a Visiting Fellow at Dickinson College in Pennsylvania, and more recently was Poet-in-Residence at The Poetry Archive in London. Sujata Bhatt�s work has been widely anthologised, broadcast on radio and television, and has been translated into more than twenty languages. Currently, she lives in Germany with her husband and daughter.